Layer by layer, a crumbling 18th-century flat in the middle of Barcelona found new life at the hands of architect Benedetta Tagliabue. 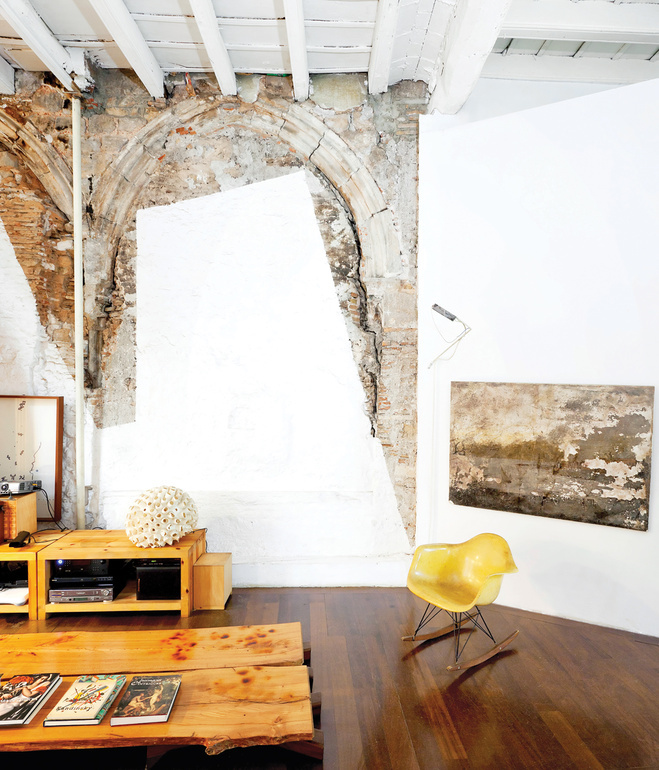 When Tagliabue and her husband, the late architect Enric Miralles, began knocking down walls inside what was to become their home they discovered an original arch suspected to be a remnant of the city’s Roman past. Immediately halting the crew, Tagliabue and Miralles decided instead to celebrate the aesthetic juxtaposition by leaving it all in situ. In deference to neighbors, and heritage, when the time came to rebuild their home in San Juan, Puerto Rico, the residents decided to keep parts of the original house intact, like the arch. Thanks to a contemporary interior that she’s been updating for a decade, architect Abigail Turin has learned to love her traditional 1925 San Francisco home. Rather than indulge her impulse and strip away the home’s traditional flourishes—the French doors, baseboard trim, iron fixtures—she embraced them, creating what she calls “a dialogue between minimal detailing and a traditional backdrop.” Turin embraced the dark in her striking living room, allowing natural light only through the original archways and windows. From the street, this 18th-century stone residence blends in inconspicuously with its neighbors in the old city of Safed in the north of Israel. Architects Henkin Irit and Shavit Zohar preserved the historic shell, while introducing contemporary elements to the interior including concrete, wood, steel, and glass. Warm and casual furniture is favored in the courtyard. Colorful seating, wood stools, and smart built-in shelving complete the space. To the right of the table, the original stone arch leads to the home’s wine cellar. A Belgian couple took a gentle approach to transforming a tired 1930s brick house into a vibrant workshop. The couple retained the strongest architectural aspects of the house, such as the existing arch in the hall, and did away with others, such as a previous kitchen renovation. Austin architect J.C. Schmeil converted his family's 1935 bungalow into a spacious modern family home on a modest budget. An original arch and wall framing was retained between the dining room and the kitchen. The acclaimed Italian designers Ludovica+Roberto Palomba carved a serene retreat out of a 17th-century oil mill in Salento, filling it with custom creations and their own greatest hits. The couple realized that they could put their own imprint on the house but still retain its raw spirit, keeping the ancient stone floors, walls, and arches intact. New Zealand expat, Debbi Gibbs and her son use their prefabricated retreat on Lake Iosco, New Jersey, as an outdoorsy counterpoint to city life. Gibbs’s son Blake had one design requirement: bunk beds. Specifically, he wanted “two sets of single bunks, one on each side, with a bridge over the top.” Gibbs says the Venetian-style arched bridge connecting the two beds exceeded her expectations.